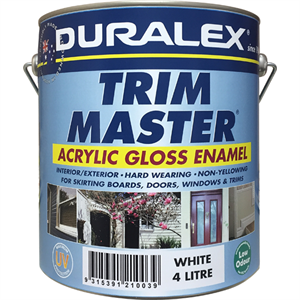 Duralex TRIM MASTER ACRYLIC GLOSS ENAMEL is a 100% Acrylic cross-linking house paint which has a specially formulated "non-stick" finish. It combines easy application, low odour of a water-based paint with the self-leveling and toughness of an alkyd enamel. Sizes 500mL, 1 Litre, 2 Litre, 4 Litre and 10 Litre. Clean Up Do not pour left over paint down the drain. Wash all equipment with clean water. (See Product Information Sheet for disposal). Any dried spots may be removed using methylated spirits and a clean cloth.